In California, Salinan Indians Are Trying To Reclaim Their Culture And Land Allison Herrera is Salinan, a California tribe that's not recognized by the federal government and has no land or sovereignty. She explains how that lead her family to lose its ancestral home. 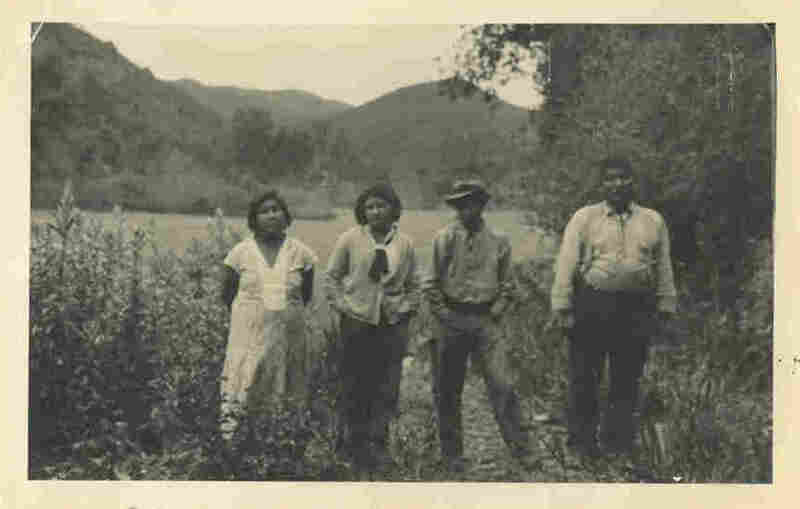 An archival photo from the early to mid-1930s of Allison Herrera's family near Toro Creek, an ancestral village of their Salinan Tribe. From left: Felista Rosas, her great-grandmother; Anna Herrera, her grandmother; Andy Rosas, Anna's brother; and Ramon Rosas, Andy and Anna's uncle. I grew up in San Luis Obispo, a small town about 20 miles inland from the Pacific Ocean in central California. I was raised primarily by my grandmother, Anna Herrera. She was a very affectionate woman who liked to tell jokes and stories and take walks along the river behind her small house. But there was one thing we hardly ever talked about. I knew we were Salinan Indian, but — scarred by a history of racism and oppression endured by her family — she rarely brought up what happened to us. The Salinan suffered what all California Indian tribes went through: genocide. Spanish missionaries came in the 18th century and forced them into slavery to build 21 missions that still line the state. In 1849, the gold rush brought settlers from the east into California and drove many Indians from their traditional hunting and gathering places. The situation turned dire in 1851 when Gov. Peter Burnett declared during his state of the state address that "a war of extermination will continue to be waged between the races until the Indian race becomes extinct." Many, including our own Salinan people, hid in plain sight, taking on Spanish names. In 1997, I was in my early 20s and working on a short film about my then-76-year-old grandmother. I asked her to take me to where many of our ancestors are laid to rest: a place called Toro Creek, nestled in the Santa Lucia mountain range. With gorgeous views stretching from the mountains to the sea, it's prime California real estate. My family lived at Toro Creek, an ancestral Salinan village, for generations — my great-great-great grandmother Clara Encinales is buried out there. But the Salinan no longer have land. One reason for that: The Salinan are among 40 California tribes that lack what's known as federal recognition. That's due to a number of factors, including being forced into labor by Spanish missionaries. Because they're not formally recognized by the federal government, the Salinan were left without land or sovereignty. My family managed to keep their home at Toro Creek until 1934, when they got a notice from the San Luis Obispo County Court. It said that the Marre Land and Cattle Company were the rightful owners of the land. My family disagreed and took the company to court. 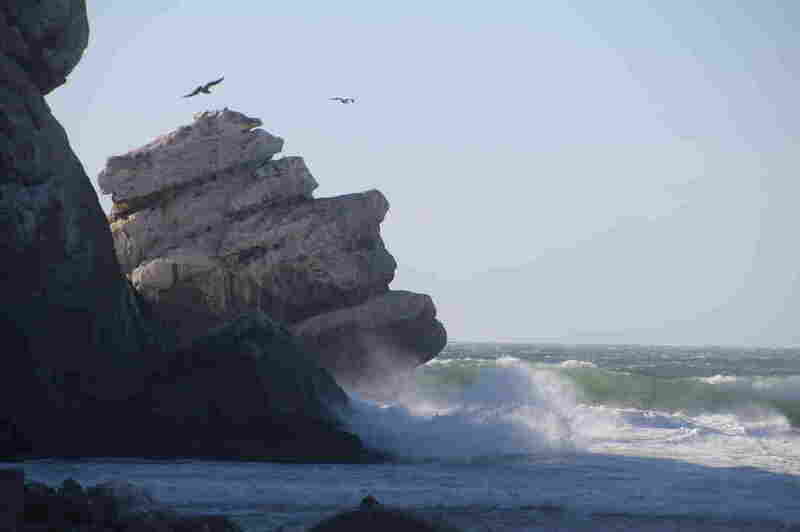 The Pacific Ocean crashes against Morro Rock, a sacred place to Salinan Indians. During our walk in 1997 down a dirt path to Toro Creek, my grandmother recounted what her mother told her about the court case. "They come in there and said, 'Hey, this is mine,' " she said. "And there was nobody to contest it, nobody had any money." The family appealed the decision but ultimately lost. When I eventually got hold of the court documents, I found out my family was ordered to leave their home. They had no legal claim over the land. Before my grandmother died in 2006, we went to Toro Creek a handful of times, often having to explain to the owner of the adjacent property who we were and why we'd come. She came to clean up the gravesites, which were marked by coffee cans sticking out of the ground, past the cabin where her grandmother used to live. More than 60 of my Salinan ancestors are buried there. The tribe is preparing to apply for federal recognition — it's an expensive and time-consuming process that only a few other tribes have successfully pursued. But Salinan are split on whether it's worth the effort. Some Salinan people think the tribe's energy is better spent on educating the next generation on Salinan language and culture. Mary Bishop, a 78-year-old Salinan elder, supports the push to appeal for federal recognition. We met at Mission San Antonio de Padua, an 18th century Spanish mission near the town of Jolon, also in central California. The Spanish used the Salinan as free labor to build this adobe church and monastery on what was the tribe's ancestral territory. Bishop wants to be able to claim this land around the mission as our own. "And if we become recognized, which I'm hoping that we do, we can at least apply for a piece of this ground where all our people walked when they were free," she says. Gregg Castro is the former vice chair of the Salinan Tribe. He's worked on applying for federal recognition and thinks it's not worth the effort. Instead, he says, we should recognize ourselves as Salinan first and foremost — and focus on preserving and passing down the culture. "When our native communities come together and understand who they really are and where their power really is, it's not in some paper the government hands you. It's in the ceremonies and songs you sing," he says. Castro and I spoke at Morro Rock, a sacred place to us Salinan that is now a state park. When my grandma was alive, we'd come here often. I find it ironic that Salinan have to ask the federal government for permission to be who we already are and to live on land that we lived on for generations. Whether Salinan gain federal recognition, we know ourselves and are actively working to regain what is lost. Debra Utacia Krol co-wrote this story, which is part of the Inter(nation)al project supported by NPR's Story Lab. Additional funding came from the Pulitzer Center on Crisis Reporting.